This collects the three previously released DC Showcase shorts (Green Arrow, The Spectre and Jonah Hex) in slightly expanded versions in addition to a new short, the 22 minute Superman/Shazam! : The Return of the Black Adam. I’ve already seen the previously released shorts and feel that The Spectre piece is by far the best, but all are entertaining. What I really want to talk about is the Superman/Shazam! piece. Unless you really know the characters, Shazam! isn’t the hero, rather the Ancient Wizard who granted Billy Batson the power of the gods when he spoke the name aloud. The hero’s name is Captain Marvel. I want to preface this that Captain Marvel is one of my favorite characters of all time (as is Superman), and despite his one time popularity (His comics used to sell over a million copies a month. The best selling book now might break 100,000 copies), he spent many years dormant (the result of a lawsuit, ironically enough by National Periodicals, the owners of Superman. Years later National Periodicals, then DC Comics acquired the ownership from the defunct Fawcett Comics). Captain Marvel has always been a magical character (no pun intended) and unfortunately over the years, most attempts to resurrect the title have failed due to a lack of understanding of the character. Suffice to say, Superman/Shazam! 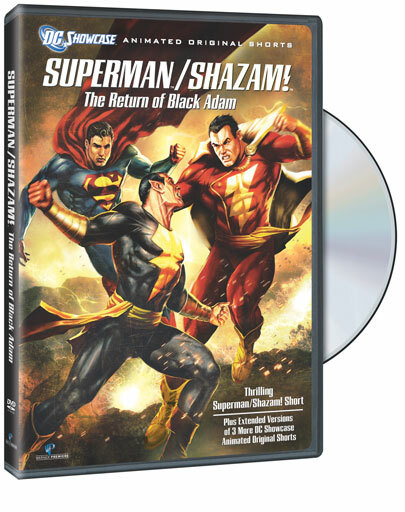 : The Return of the Black Adam works, not entirely using either the classic or modern interpretation of the mythology, but an amalgam of the two. It is, in my opinion, 22 minutes of the best animated superheroics ever put together (including the classic Batman: The Animated Series, Superman: The Animated Series, Justice League Unlimited and The Sensational Spider-Man). Visually inspired by Josh Middleton’s comic art of the Superman/Shazam: First Thunder! mini-series, this short should serve as a pilot to an animated series. Included are the origin, the introduction of some of the supporting characters and an arch enemy that not only is a challenge for Captain Marvel, but for Superman as well. The voice performances are excellent, with George Newbern and Jerry O’Connell reprising their roles as Superman and Captain Marvel from earlier animated incarnations. Also excellent are James Garner as the Wizard Shazam, Arnold Vosloo as Black Adam, Zach Callison as Billy Batson and Kevin Michael Richardson as a surprise character from the Shazam mythos. If you are a fan of Captain Marvel or the DC Universe in general, this dvd is one of the best yet and sets the bar even higher for upcoming DC Animation releases and hopefully serves as a test for future Captain Marvel films. Highly recommended.